Need more information about booking Home 7227721 ? Why settle for a room with a view when you can have a whole house with superb views! 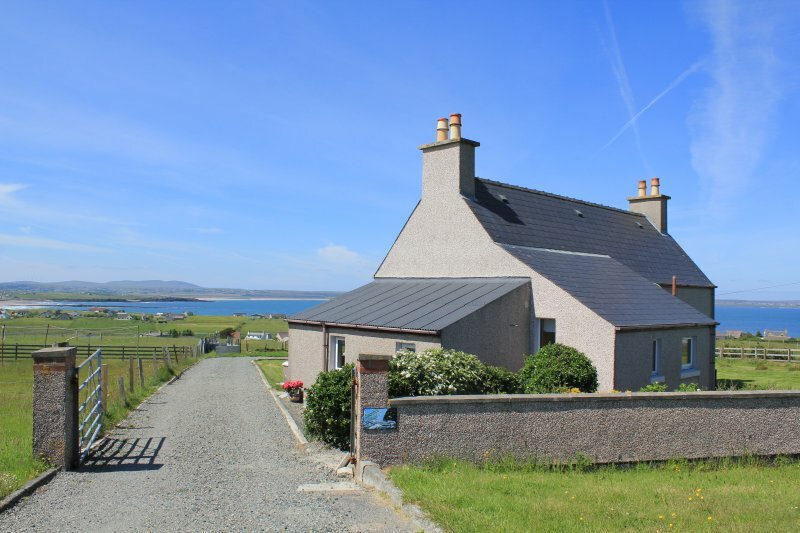 Situated on the Isle of Lewis, Seascape Cottage has fabulous panoramic sea views looking south towards the Harris & Uig hills and north over Broad Bay. It also overlooks the Braighe and Mealabost beaches although with so many great beaches on Lewis and Harris you’ll be spoilt for choice! Recently refurbished and retaining much of the original internal wooden cladding giving that extra holiday seaside feeling. The property is suitable for those with limited mobility, with a double bedroom and bathroom downstairs. The cottage offers the tranquillity of the islands but with the added convenience of being only a 10 minute drive from the main town of Stornoway where you will find most amenities. There is also a village cafe and community shop within a few minutes walking distance where you can buy local produce. It is the perfect location for visiting the various attractions the islands have to offer whilst also being close to the airport and ferry terminals. Whether it’s the spectacular scenery, the fantastic wildlife, outdoor pursuits or just looking for a place to “chill out“ Seascape Cottage is the place for you. Free Wifi available. The "long" island of Lewis and Harris is mainly geared to car owners, but there are also opportunities for cyclists and walkers. If you dont have a car then there are local buses that serve most of the island, but you may want to study the timetables first if planning an excursion. Taxi's are also a popular option for visiting the main tourists sites and can act as personal guides as well!. For the more adventurous there are various sea excursions from Stornoway, Tarbet and near Uig ranging from short trips to see wildlife to full day trips e.g. St Kilda. All bedding and towels are provided (not beach towels). All electricity, heating and broadband are inclusive in the price. Please note, we do not provide a hairdryer. We are within easy reach if you require assistance or have any questions at any time. Remember to bring cameras and binoculars! Any damage caused must be reported to the owner immediately so it can be rectified before the next guests arrive. If bringing dogs please let us know at time of booking (no extra charge). We generally accept 2 house trained dogs (no other pets), contact owners if you have any questions. Please note, dogs are not allowed in the bedrooms or in the bath and it is your responsibility to clean up any dog mess and put it in the Black Non-recycling bin (please use poo bags). This House has 3 bedrooms, 1 bathroom and sleeps 6. It’s been listed on Holiday Lettings since 23 May 2016. Located in Isle of Lewis, it has 33 reviews with an overall rating of 5. The average weekly rate varies from £550 to £962. The cottage is very comfortable and was well equipped. It had lovely views overlooking The Braigh & Broad Bay. It is in a good location for different trips and activities planned. We would certainly use this accommodation again. The owner is very pleasant, helpful and accommodating. Loved the cottage and the tasteful decor in a nautical theme. Modern appliances, plenty dishes, cutlery, glasses etc. Comfortable beds, lots of seating and good heating. Stunning views, so peaceful and quiet but only ten minutes drive into Stornoway. Weather was so nice, we even managed to eat out at picnic table in front garden. Would love to return. What a wonderful peaceful haven Seascape Cottage is. Close enough to Stornoway and other attractions too. Gorgeous sunsets most nights. Cottage very well equipped. Missing it already. Owner's reply: Thank you for such a great review! We are so pleased you had a lovely christmas and enjoyed your time at the cottage. This is a beautiful and charming cottage, well maintained by the owners Morag and Richard. It is only 5 minutes drive from the centre of Stornoway and is within walking distance of a local shop and cafe known as Buth an Rubha. The views over the bay are spectacular. The cottage itself is clean and fresh with 3 bedrooms, a lounge, breakfasting kitchen, and a dining room. All bedding and towels were clean and fresh and the kitchen well equipped for all kinds of cooking and baking. It contains a really large fridge and freezer. The owners popped over on our first day to check everything was ok, and were friendly, helpful, and knowledgable. They had also left us a welcome pack with milk, sugar, coffee, tea, and biscuits, as well as cereal boxes for my daughter. The central heating system kept the cottage lovely and warm, despite the cold weather outside. It can be managed via the thermostat, and by controls on each of the radiators. There is only one bathroom/toilet, which posed a slight problem for 4 of us, and I felt the shower was quite weak when it came to rinsing shampoo from my rather thick hair. None of these minor issues would stop me from revisiting the cottage though. I would thoroughly recommend this cottage to anyone who is looking to stay on Lewis. Thank you very much Morag and Richard, I look forward to returning to your beautiful home in the future. Owner's reply: Thank you for taking the time to write such a lovely review and glad you enjoyed your stay.